Fred Downs, a 72-year-old Vietnam war veteran, remembers fighting back tears when he regained the ability to pick up objects with his left arm after a gap of 40 years. Artie McAuley, a captain involved in a serious car accident, smiles as he talks about being able to once more throw both arms up to celebrate a touchdown while watching American football. Both men took part in a demonstration of their futuristic prosthetic arms on Friday at a veterans hospital in New York. The third generation device is named the LUKE arm, after the robotic arm Luke Skywalker gets after his fight with Darth Vader in Star Wars. After years of testing, the first demonstration of the devices—which can grasp an object as fragile as an egg, or as small as a grape, or even allow the user to turn a screwdriver—took place in Washington in May 2016. 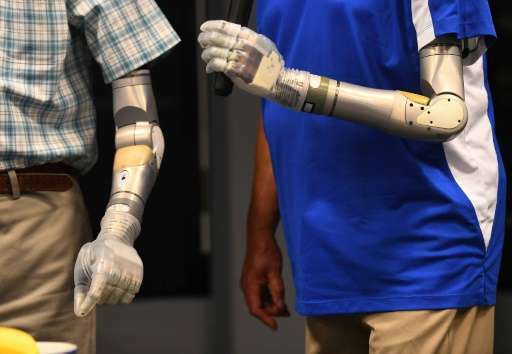 Jay Burkholder—who heads the American firm Mobius Bionics that manufactures the limbs—said dozens of units could be made available for sale this year depending on orders. Each unit would be made to order, Burkholder said, though he did not disclose the price. But Dean Kamen—founder of the Deka company that developed the limbs in collaboration with DARPA, the Pentagon's research and technology wing—said the tag would come in around $100,000. Veteran amputees are set to be the first beneficiaries. More than 1,600 American soldiers have lost limbs in the wars in Iraq and Afghanistan. And veterans hospitals treated around 20,000 arm amputees in 2016, according to David Shulkin, the Secretary of Veteran Affairs. Learning how to use the arms requires practice and can take several weeks. Movement is linked to foot motions captured by sensors in the wearer's shoes. An amputee lifts a foot in order to lift an arm, and vice versa. "You have to be smart to do this," McAuley laughed. "Once in a while, I make a mistake!" Linda Resnik, who is leading a national study of veterans' amputations needs, told AFP nearly 80 people are currently being trained to use their new arms. But for the time being, a lack of devices means even those who have started using them cannot keep their arms. According to Resnik, Downs and McAuley are "the first two to not have to give it back." The U.S. supports millions of generational welfare bums. They can surely pay to outfit veterans with good prosthetic limbs. A few hundred dollars worth of parts at most and they are going to sell for $100,000? When did the Pentagon get in the same business as drug makers? Yea, I know the Deka company is the ones going to sell them and the research costed a lot but you can also bet the overwhelming majority of it was paid with our tax dollars. Very few people are going to be able to afford that and very few insurance companies are going to want to pay for one either. 24volts: probably these are the starting r&d costs and they might consider that by the time they start breaking even other far superior designs will appear. Yea, I know the Deka company is the ones going to sell them and the research costed a lot but you can also bet the overwhelming majority of it was paid with our tax dollars. You know I have a very low opinion of soldiers. But their naiveté was abused to have them kill (or be killed) so that you could have cheap prices at the gas pump. So I think it's in order to afford them some slack and at the very least patch them up with the best the market has to offer.